Rating: 6.6/10. From 55 votes. 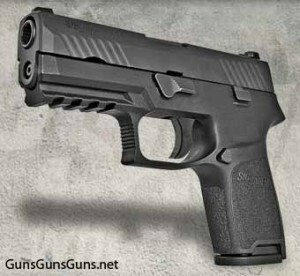 Summary: The description, specs, pricing, photo and user ratings for SIG Sauer’s P320 Carry pistol. The P320 Carry from the left. A threaded barrel is optional, as is an extended fit magazine. SIG says it designed the P320 to simplify and make safe the disassembly procedure. The three-point take down system prohibits disassembly unless you remove the magazine, and it prohibits takedown unless the slide is locked to the rear. And, simply rotating the takedown lever allows disassembly without tools or trigger manipulation. Note: This pistol is not California or Massachusetts compliant. This entry was posted in .357 SIG, .40 SW, $501-$750, 9mm, Compact, Full size, Semiauto, SIG Sauer on January 15, 2014 by Staff.